When the master of ceremonies [at the wedding celebration] tasted the water that was now wine, not knowing where it had come from (though, of course, the servants knew), he called the bridegroom over. "A host always serves the best wine first," he said. 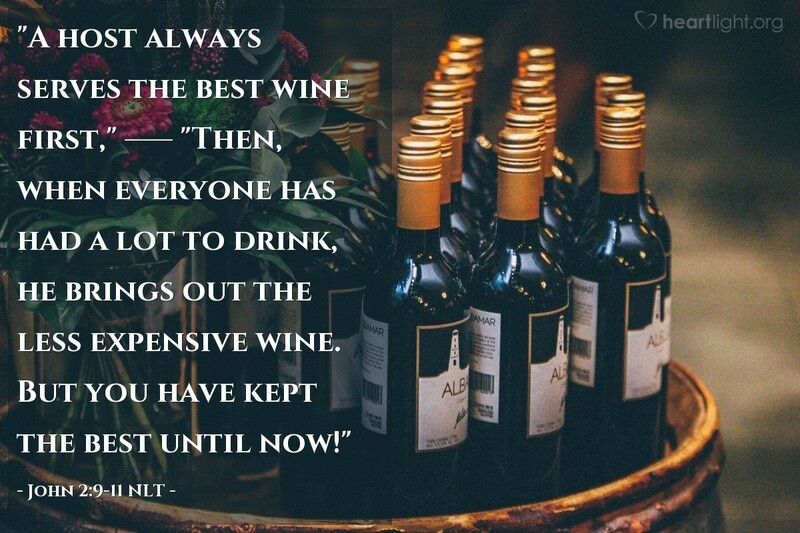 "Then, when everyone has had a lot to drink, he brings out the less expensive wine. But you have kept the best until now!" This miraculous sign at Cana in Galilee was the first time Jesus revealed his glory. And his disciples believed in him. It wasn't the right time. It wasn't the right place. It was, however, the right Lord! So when Jesus asked, and people obeyed, the disciples got to see a little of Jesus' awesome glory, and their faith was stoked! The little ember of their faith in Jesus was set ablaze. Let's not forget that is what John's story of Jesus is all about; John wants to stoke the flame of our faith until it gives us genuine and eternal life. Being a disciple of Jesus is all about accompanying Jesus daily through the ordinary ups and downs of life, doing what Jesus asks us to do, and looking for his glory to be revealed to us. We change, our lives are enriched, and our faith is set ablaze when we obediently journey with Jesus each day. Holy and righteous God, my loving Abba Father, give me each day the bread I need for food and the grace I need to share with those around me. As I live my everyday life, please help me see Jesus' glory at work in ways I never have before. Father God, I don't ask this for my entertainment or for my selfish interest, but so that my faith may grow stronger and my Christian witness more powerful, to your glory. In the name of Jesus, I pray. Amen.